By Dan Ambrose: Trainer Abel Sanchez says that he believes that the winner of the Miguel Cotto vs. Saul “Canelo” Alvarez fight on November 21st will likely run away from a fight against WBC No.1 mandatory challenger Gennady Golovkin rather than taking the fight against him next year. Sanchez, who trains Golovkin, says it doesn’t matter if the Cotto-Canelo fight decides to dash away from the Golovkin fight, because they’ll be giving up the WBC middleweight title in the process. That’s the belt that Golovkin is after. He doesn’t care if they both avoid him. He just wants the WBC 160lb title. The World Boxing Council president Mauricio Suliaman has already said that the winner of the Cotto vs. Canelo fight must fight Golovkin next if they want to keep the belt. If the winner decides he doesn’t want to fight Golovkin, then the WBC belt will be stripped from the Cotto-Canelo winner and either given outright to Golovkin or put up for Golovkin to fight for against the next highest contender. Sanchez says Golovkin will look to fight the winner of the October 10th fight between WBO middleweight champion Andy Lee and Billy Joe Saunders. If Saunders wins the fight, it’s not likely that he’ll fight Golovkin, because he already said recently that he doesn’t want to fight Golovkin. It’s possible that Saunders could change his mind if HBO decides to make it a pay-per-view fight between him and Golovkin, but that will largely depend on his well Golovkin’s pay-per-view fight does against David Lemieux on HBO on October 17th. If it brings in a lot of buys, then it’s possible that HBO will give the green light to a Golovkin-Saunders fight on PPV, but it’s still unlikely though. Saunders doesn’t have a large fan base in the U.S. It would be far better if Lee were to win the fight because he’s popular on the East Coast of the United States. I think it’s pretty much a given that the winner or loser of the Canelo vs. Cotto fight won’t be facing Golovkin. De La Hoya has already said that he wants Canelo to fight Golovkin eventually down the road, and Cotto has said that he’s not going to be forced into a fight against Golovkin or anybody. I don’t know who Cotto will face if he doesn’t get the fight with Golovkin, but he’ll make money even if he goes back to fighting the Daniel Geale and Delvin Rodriguez type opponents. The only difference is he won’t have the WBC middleweight title any longer. I don’t think that really matters though. Cotto will make money even if he just fights scrubs in non-title fights for the remainder of his career. “But Oscar [De La Hoya] being a business man and Oscar being a promoter, once we destroy Lemieux, Canelo is the only one he [De La Hoya] has left [in his Golden Boy Stable] at that weight and at that level,” Sanchez said. “So if Oscar studies that well, he may opt to get a couple of fights before facing Golovkin,” Sanchez said. It’s definitely going to be an avoidance thing for De La Hoya and Canelo in my view. Canelo is the last Golden goose in De La Hoya’s stable, and if Golovkin plucks him clean, then there won’t be anyone else left for De La Hoya. Golovkin will have already beaten Lemieux, and there’s no one else near that weight for him to depend on. 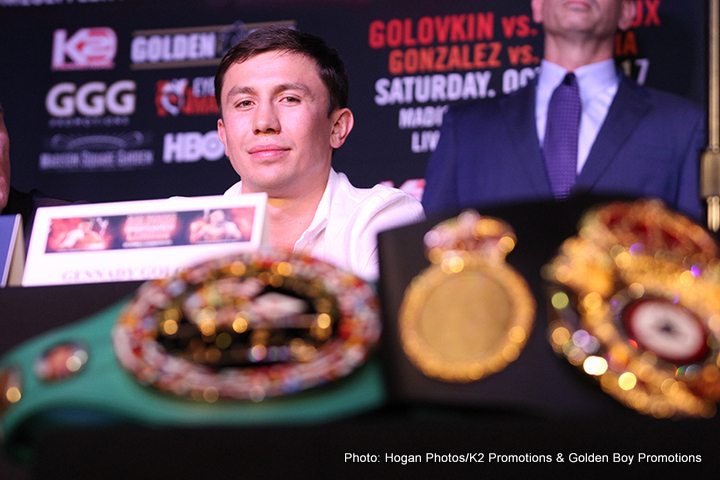 It’s likely that De La Hoya will guard his golden goose like a mother hen to keep him from getting plucked by Golovkin.